Zaina Lodge is the kind of safari lodge that holiday brochures are made of – the kind advertised for the wealthy; the typical set up where elephants roam at a watering hole in sight from the loggia and water ripples over the infinity pool into the hazy sunset. But whereas most brochures are filled with those located in east and south Africa, where there this would be just another among many, Zaina Lodge is the first luxury safari lodge in west Africa, located in northern Ghana, a region rarely tapped by foreign visitors or even southern nationals. Zaina Lodge is as far away as it sounds – a plane journey from the capital Accra, or a 700km drive from coastal lowlands, through tropical rainforest and into hot, dry savanna. While other big game national parks in Ghana are still only accessible by private vehicles, Zaina Lodge is in Ghana’s most touristy park, Mole. There are formal expeditions by car or foot, but until now accommodation has been restricted to camping or the Mole Motel, built for socialist government officials and once no doubt high-end, but now faded 1960s white modernist glory. Conceptualised by Andy Murphy and John Mason six years ago, Zaina Lodge is the second hotel in the park and has been designed, as its director of operations Arvind Gangadharan explains, ‘to put the northern part of Ghana on the tourism map’. US and Canadian-born expats who have worked in wildlife for years in Ghana, Murphy and Mason believed that to improve conservation practice, ‘one of the obvious ways is by having a very high-end lodge, ensuring some of the revenue is injected back into the cycle… Not many people get this far, people know the park is here but this project is about making something to come for.’ Its target is wealthy Ghanians, west Africans and foreigners living in the country, for weekends away or replacing trips abroad. 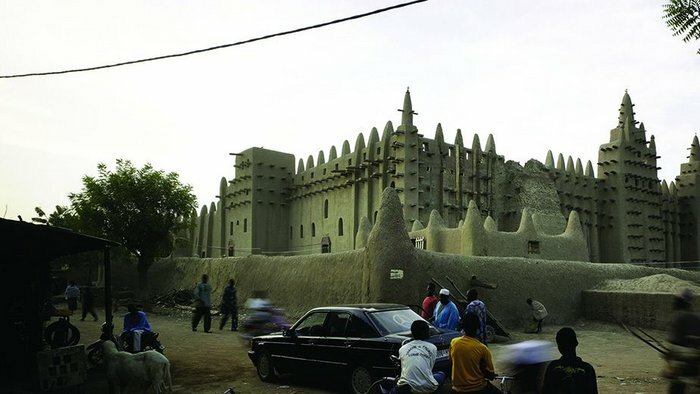 The mud wall is decorated in the style of the 15th century mosque in nearby Larabanga. But forget conventional planning practices and modes of construction. Zaina Lodge encompasses a kind of ‘slow build’ mentality that is respectful to place and nature. It aims to prevent the disappearance of local construction cultures and traditions, counteracting the rise of fast life and quick solutions. With one main social space (nicknamed the ‘cathedral’), 12 and 13 guest chalets either side and several ancillary buildings, the project took 28 months to complete. It is built on a land concession; getting a lease for land to build on in the park in exchange for offering employment opportunities and commitments to the locality and local people. Not to say this kind of system doesn’t have its problems, being mostly possible for people who are in a position to build the necessary networks and relationships that make them happen, but here is has resulted in something mindful with a long-term view. Five percent of the revenue from each room is paid back to the forestry commission that owns the land and behind the lodge is an environmental philosophy that is difficult to fault. It fights so many current issues that are observable across the country: a backlash against packaged water, litter and the westernification of architecture. The project is driven by a determination to match globe-trotting elite construction standards and instil new ideologies under difficult conditions, in what is still a developing country. From the beginning, local people were involved. The longest serving ranger, someone who started as a boy soon after the park was designated a protected area in 1958, helped to find the plot in the park, on the top of a cliff edge called Target Ridge. Of the construction workers and staff, 80% are from nearby villages and were trained up along the way – for example by facade builders from the capital Accra and thatchers from neighbouring Burkina Faso. Materials are local too: the stone cladding and paving were manually dug out from the rock to make the swimming pool, mud walls incorporate the red dirt of the site, water is pumped out of two new boreholes using solar energy, and the structure is constructed of teak from Sunyani. Even the concrete blocks for walls were made on site by hand again. Some local people have gone from being construction labourers to hotel rangers - that is how transformative the project has been. The smallest details have also been considered; with baskets from Bolgtanga and shea butter from the nearest village Larabanga – which also supplied the people who did the decorative plasterwork in the manner of its 15th-century mosque. This approach also extends as far as possible to food and drink.